A friend of ours in Mexico city, named Fernando, is an expert in chilis, which of course originated in Mexico and permeates the food of that delicious country. His theory is that the reason Mexican people are usually so happy and friendly is that they eat chilis every day, usually several times a day. Chilis are spicy. This chemical burning sensation in the mouth is caused by capsaicin, found in tiny glands in the chilli's "placenta" -- that white spongy stuff surrounding the chili's seeds. There's no actual burning. Capsaicin tricks the burn-detection hardware in the mouth into believing that burning is going on. Capsaicin receptors in the mouth (quantity and sensitivity of which is partly genetic) determines how "hot" chilis feel. The pain of this capsaicin "heat" causes the the production of a neurotransmitter called substance P, which tells the brain that the mouth is experiencing pain from burning. The brain responds with neurotransmitters designed to reduce the pain, including endorphins and specifically dopamine, which makes you feel good and gives you an overall sense of wellbeing. So, yes, chilis make you happy. As a bonus, chilis are high in vitamin C (double what you find in citrus fruits), vitamin A, and b-carotene. They have antibacterial qualities, and contain bioflavonoids and antioxidants. There's literally no downside to eating chilis, and everything about them contributes to real health and happiness. But do Mexicans really eat more chilis than others? After all -- although chilis originated in Mexico thousands of years ago -- there's a global chili craze right now. Again, the answer is: yes. Mexicans eat way more chilis than anybody else. The average Mexican eats up to nine kilograms of chiles a year -- far more than the average citizen of any other country. So it looks like our friend Fernando is really onto something. Mexicans eat chilis for breakfast, lunch and dinner. Mexico is a nation drunk on dopamine. So pack your diet with chilis. And make yourself happy the Mexican way. Ikigai is a wonderful Japanese concept, one that deeply resonates with me because it helps me be centered, feel joyful and stay mindful of what’s important in life. It helps me keep things in perspective and make decisions based on reason, rather than emotion. Ikigai combines two Japanese words. The first word is ikiru, which means "to live," and the second is kai, which means "the realization of what one hopes for." Ikigai can loosely be defined as "a reason to live" -- having a life's purpose. The Japanese believe that every person has an ikigai. I believe everyone can benefit from finding their own. Knowing your purpose for living helps you continuously work on having the best life possible and becoming the best version of yourself. A state of mind is crucial in moving on and having an open mind and a warm heart that makes you feel free and liberated. To find your ikigai, letting go of emotional blocks that hold you back and suppress your creativity and joy within is key for exploring your full potential. It also clarifies any decision-making process, because if you know why you do things, you'll have a better idea about what to do. Finding my ikigai has been a long journey. My upbringing taught me some unhelpful habits of mind — resentment, oversensitivity, anger. I found these impulses hard to overcome — until I understood my life's purpose. Once you know why you're on this planet, you realize that negative emotions just get in the way. It’s something that I’ve intentionally tried to cultivate in my life, even before knew about the Japanese word, based on my own personal belief system and values. I learned to be intentional about following my own rules and aspirations to live by as part of my training when I studied to become a holistic health counselor in New York City. It’s the same approach I take with my holistic health counseling clients. As part of my health counseling program, I try to inculcate physical and spiritual development, so to speak, to create harmony. I believe that for total health, finding or discovering your own ikigai -- your reason for being -- is an important part of what makes you look forward to getting up in the morning, helps you sleep well at night, and drives you to achieve everything in between. Find your ikigai by looking for your answers to what makes your life purposeful and a joy to live. What do I love? What am I good at? What does the world need from me? What can I get paid for? Find the point of intersection where all four of these questions meet. Sometimes it's easy. For my husband, the answer to all four questions is the same: writing. And so he writes. Sometimes it's more complicated. In my own life, I know I love to eat and travel. I have a gift for making delicious, healthy food. The world clearly needs help getting healthy. And it wasn't clear what I could get paid for. It took awhile, but the answer to the question of my ikigai is: My ikigai is to help others be healthy and happy. And all that is reflected in my company, Elgan Media, Inc., (which I run and co-own with my husband and which is a food, travel & tech media company.) Our workshops, books, blog posts, podcasts, articles and The Gastronomad Experiences collectively serve as the expression of my ikigai. We all want a life of purpose, meaning and fulfillment. Ikigai is a simple concept but a truly powerful one that embodies the secret a long and joyful life. It can help, not as a lifestyle but as a process to apply to life -- an idea, a keyword or even a vision that can remind you to look into the horizon to have a good perspective on the “big picture” that is your life. Life is too short to live without ikigai. You don't have time not to find it. 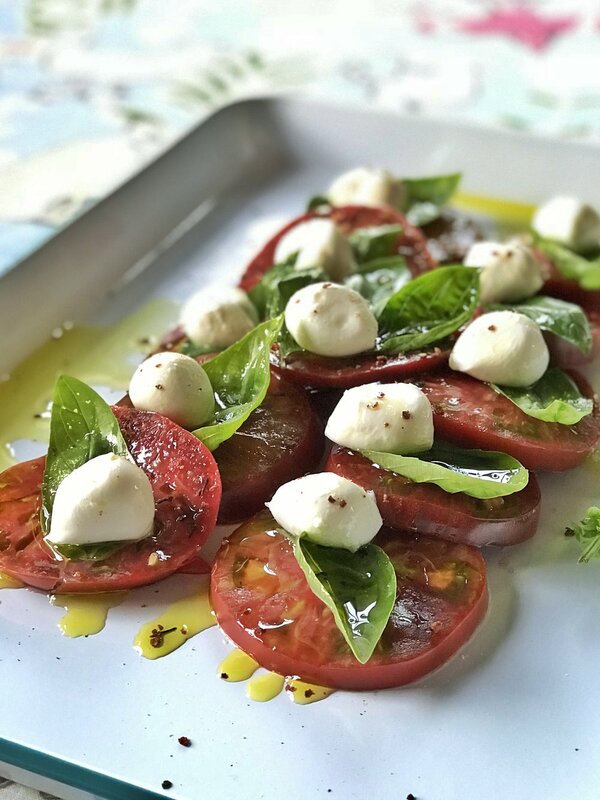 I made this caprese salad using fresh heirloom tomatoes, buffalo mozzarella, fresh basil, extra-virgin olive oil, freshly ground wild red peppercorns from Madagascar. When you drink wine, what exactly are you pouring into your glass -- and your body? Usually, it's impossible to know. Unlike food producers, wine makers aren't required to disclose ingredients on the label. In the United States, it's legal for winemakers to add up to 200 ingredients without telling anyone, including the consumer. What about that other wine you're drinking? Are they proud of the ingredients? Or do they want to make sure you don't find out what you're putting into your body? In other words, can we trust winemakers who conceal what's in the wine? Far too often, the answer is: no. Winemakers routinely add more than just the ingredients you probably know about, such as yeast, nutrients for the yeast, sugar and acid. They can and do also add clay, enzymes, gelatin, charcoal, egg whites, casein (a milk protein), isinglass (made from fish bladder), tartaric acid, ascorbic acid, malic acid, tannins, diammonium phosphate, acacia, velcorin, trypsin, pepsin, chalk, acetaldehyde, dimethyl bicarbonate and many other additives. Many cheap wines add a product called "Mega Purple," which is concentrated low-quality teinturer grapes (grapes with pigment in both skin and pulp). "Mega Purple" is added to give cheap wine color, body and texture designed to simulate good wine. And, of course, wine grapes can be grown using pesticides and herbicides, and trace amounts of these can make it into the wine -- pesticides like dimethoate, myclobutanil, tetraconazole, azoxystrobin and pyrimethanil. Most of these ingredients are assumed to be "safe" to consume. And it's up to each of us to decide whether "safe" is a high enough standard. It's also unnecessary to throw up your hands in confusion and give up. It's important to do your own research. Talk to the winemakers by visiting wineries for a tasting. Ask them directly about their methods for growing grapes and making wine and about any additives they include. The easiest way to bring astonishingly great natural wine into your life is to join the Donkey & Goat wine club. They'll ship directly to your home on a subscription basis. And seek out other wineries that share the Donkey & Goat philosophy of maximizing the true quality of the wine and adding the ingredients to the label. And as with all food producers, it's a good idea to withhold trust from any producer who tries to conceal what's in the product or how it was produced. If a winemaker is concealing what's in the wine or how it was made, you probably don't want to drink it. Congratulations to Donkey & Goat! Jared is interviewed for the podcast's Earth Day episode, and shares some insights about how natural wine is made. Jared’s brilliantly illuminates the distinction between natural and mass-produced, conventional wine. You’ll be surprised to learn some of the wine industry's little dirty secrets! For example: Did you know that there are 360 additives that are legal for wineries to use in the winemaking process, many of which in fact commonly used and which never appear on labels? Wine Enthusiast did an amazing job doing extensive research and I’m now a new subscriber, of course! Happy Earth Day, indeed! The color of most red wines in Georgia is intense. It's dark and deep. When you first pour a glass of any wine, some temporary bubbles form at the surface. With some Georgian wines, even the bubbles are dark. Georgians will tell you that wine is the ultimate health food. About a third of the people we met there make wine at home. Over the past few decades, something of a scientific consensus has formed over the health attributes of wine. Moderate drinking, especially moderate drinking of red wine, has been found to extend life and lower rates of lifestyle diseases like heart disease and Type 2 diabetes. This is somewhat counterintuitive, because wine and other drinks can contain sugar and of course all contain alcohol — excessive sugar and alcohol consumption are linked to higher rates of the very diseases moderate drinking helps with. In other words, wine improves health, while simultaneously containing attributes that degrade health. One reason isolated by research is that wines, especially red wines, contain polyphenols. These are plant compounds that exist in wine because, of course, wine is made out of grapes. While all wines are made with grape juice, some wines are also made with extensive exposure to grape skins, seeds and stems. Polyphenols are found mainly in the skins and seeds of grapes. It's from this exposure to skins, seeds and stems that gives red wines far greater polyphenol content than white wines. Orange wines and rosés also contain polyphenols from exposure to skins during the winemaking process. Even red wines vary wildly in their concentrations of polyphenols. For example, wines made from Tannat or Sagrantino grapes may have up to six times more polyphenols than a typical cab or merlot. In general, there's a direct connection between the darkness of a wine and its concentration of health-giving polyphenols. Which brings us back to Georgian wines. Some early research has found, unsurprisingly, that Georgian wines made from the Saperavi grape variety contain far higher concentrations of the polyphenol resveratrol than both major European grape varieties and even other Georgian varieties. Also: The Georgian method for wine-making involves a natural process with heavy contact with skins, seeds and stems, natural fermentation (no added yeast) and fermentation in terracotta pots buried in the ground. The Georgians are right: Georgian wine is super healthy. One way to look at high-polyphenol wines is that it enables you to maximize the benefits of polyphenols while minimizing your intake of alcohol and sugar. You might get the same polyphenol benefit from two glasses of dry, high-polyphenol as you'd might get from two bottles of a lower-polyphenol wine. It's obviously healthier. In any event, you don't need to be a wine expert or scientist to choose the healthiest wines. 1. Natural and traditional winemaking methods. The only ingredient should be grapes, not yeast or additives. Added sulfites are OK in very small quantities. 2. Look for wines made with grapes grown using organic or biodynamic methods. 3. To maximize polyphenol content, go for very dark, bold, heavy fruit, bitter and tannic wines, and drink them young. 4. To minimize sugar intake, favor dry wines. 5. Favor lower alcohol wines. So there you have it: Five things to look for to maximize the health-giving quality of the wine you drink. Remember: It's still OK to drink white wines, aged wines, sweet wines and higher alcohol wines if you do it in moderation. Moderation is a virtue, and so is variety. Also remember that wine isn't a cure-all. It can be part of an overall Spartan Diet that includes a very healthy and varied diet, daily exercise, stress management and clean water, air and environment. But if you want to maximize health in the wine you drink, go for my five criteria when choosing wine. I'm currently in heaven on Earth (also known as Provence, France) while organizing my upcoming Gastronomad Provence Experience. I bought some French lentil beans a few days ago in the village of Orange. And I also picked up all the seasonal local produce I could find this time of the year at the local organic farmer's stand during the Thursday's farmer’s market in L'Isle Sur La Sorgue, our temporary home here. The market sets up by the church just steps away from where we're living. It's the end of February on a very chilly 22-degrees F weather and our first time visiting Provence in the winter. Naturally, I've I just made a big batch of lentil soup using what I had on hand, plus some dried thyme and also dried rosemary from our hostess' garden. The whole time I cooked it with the soothing sounds of the beautiful music she plays often -- mostly classical and opera. 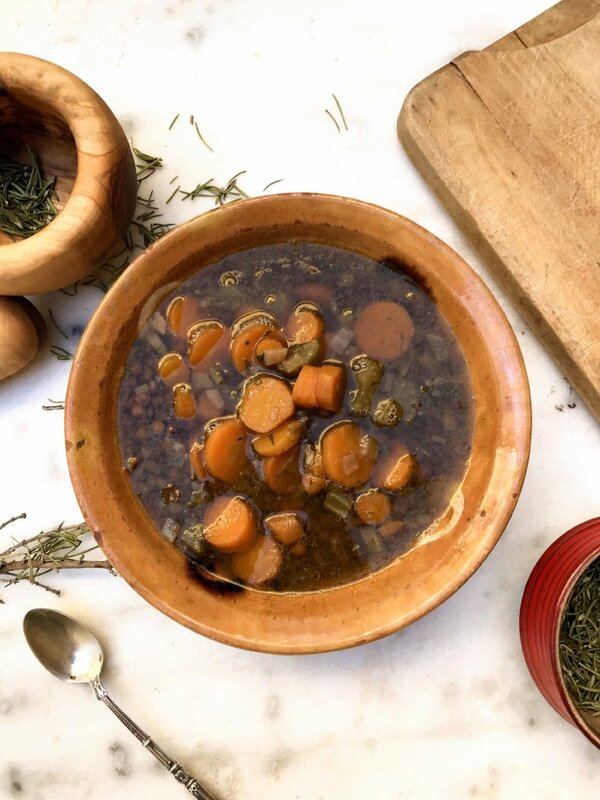 The kitchen smells divine from the lentil soup and the sweet aromas of rosemary and thyme. The cute kitchen is small but functional and well equipped for its size. The home feels like it has a life of its own and I'm so in love with its coziness and simplicity, but quirkiness that's inevitable as residents customize and accommodate over the centuries. I especially love the all exposed large beams in the ceiling. The owner of the house is a wonderful French woman, who's now our friend. She lives in the upstairs of the house and we're renting the downstairs. We share the kitchen and we've been sharing some meals. She has just invited us to dinner tomorrow night. Apparently, French Onion Soup is on the menu. The house reflects her charming personality, friendly disposition and the warmth of her character. She's lovely and so is her home. Play some classical music and pour yourself a nice glass of wine to slowly sip as you cook with ♥! In a large heavy bottom pot, slowly heat olive oil over low to medium heat. Add onions and sauté for 5 minutes stirring occasionally. Stir in celery and carrots sautéing for 10 more minutes (add more olive oil if too dry). Stir in leeks and garlic and sauté for 15 more minutes over low heat with lid closed (stirring occasionally). Drain soaking lentils and discard soaking water. Rinse lentils under cold running water until water comes out clean. Add lentils to sautéed veggie mixture followed by vinegar and 10 cups of water. Close with lid and simmer over medium to high heat for 20 minutes (set timer). If thick foam builds up on top, remove it with a spoon. Stir in the rest of the ingredients: parsley, thyme, rosemary, cumin, black pepper and salt. Continue to simmer for 20 minutes over low heat or until the lentils are soft to the touch (stir occasionally and keep lid closed). Adjust seasoning and salt as desired. Serve with drizzled fresh lemon juice, extra virgin olive oil or cultured butter and or yogurt. Add more fresh herbs and or ground cumin then eat and share with ♥! I've been saying for almost two decades that the key to weight loss is bringing the body into balance. And the key to balance is food quality. Now, new research from Stanford Prevention Research Center and published in last week's edition of JAMA (Journal of the American Medical Association) found that people who cut back on sugar, "refined grains" and "highly processed foods" and who didn't worry about calories or portion size, lost significant amounts of weight. The study was conducted on more than 600 people. In other words, researchers concluded that quality, not quantity, is what counts for losing weight. The study was a pretty blunt instrument for revealing the importance of food quality. They started with overweight subjects, then cut down on major kinds of low-quality foods -- for example, sugary soda type drinks, which are among the lowest quality foods you can consume. For decades, the Diet Industrial Complex has erroneously equated calories with weight loss -- the idea is that if you eat more calories than you "burn," then you gain weight, and that being overweight is the result of eating too many calories (as if the spectacularly complex biochemistry of metabolism were comparable to filling up the car with gas). In recent years, other research has contracted this assumption. We've found that compromised gut microbes affect body weight. The amount of sleep you get affects body weight. Stress causes weight gain. People who drink diet beverages gain more weight than those who drink the sugary kind. All these clues suggest that body weight is not a simple matter of calories-in, calories-burned. Healthy newborn babies enter the world with a complete set of self-regulating systems designed to keep everything in balance. Our bodies brilliantly maintain balance in body temperature, blood water levels, blood pH, blood pressure, blood salt levels, sleep and the elimination of wastes. The human body is magnificent at simultaneously maintaining balance of hundreds of sub-systems throughout life. Optimal weight is another thing the human body is great at balancing. Our taste and olfactory senses are programmed to enjoy foods that keep us healthy. The hunger-satiety cycle tells us when to eat and when to stop. If we gain weight, it doesn't mean we're not effectively counting calories. It means our body's system for maintaining healthy weight has been broken. The short answer is that our food did. The longer answer is our industrial food system, environment and lifestyle conspired to knock our bodies out of balance. Let's start with what's wrong with our food. Far too much of the food we eat has been ultra-processed. Stripped of nutrients, modified beyond recognition, sterilized, and augmented with non-food chemicals, our food isn't fit for human consumption. Most processed food is too soft. Simple carbs like sugar and white flour-baked goods, processed oils, fatty meats -- too much of our food is eaten and digested too quickly and easily. While most dietary advice focuses on the biochemistry of foods (fats, carbs, protein), researchers have demonstrated the importance of biophysics. You'll gain more weight with soft food than rougher food (whole grains, fresh fruits and vegetables, etc.) even if the calories are the same. Processed industrial food is also unhealthy for our gut flora. While some of the food we eat goes straight into our bloodstreams, other foods and food components are eaten by the trillions of microbes that live in our digestive tracts, and our bodies are then nourished by the flora. Foods that our gut microbes eat are called prebiotics. The best sources of prebiotics include whole-grain wheat and barley, berries, specific raw fruits and vegetables, flax, garlic and other foods. When we're born, our guts are sterile. We acquire the hundreds of species of microbes necessary for optimum health from our food and the environment. Simply eating organic strawberries, fresh salad, organic whole grain bread or eating raw-milk cheese supplies the kind of gut microbes we need for optimal health. But these aren't the kinds of foods that most people eat. Canned, bottled and most packaged food is sterile to keep it from decomposing. Our bodies were never designed to eat so much sterile food. Even fermented foods, which were traditionally used to improve the nutritional quality and flavor of and preserve food, as well as supply our gut microbes with vital reinforcements, are now sold in a sterile form. For example, olives, sauerkraut, pickles and others are sterilized for mass production and distribution. Milk is usually sterilized through pasteurization before being sold for drinking, or being made into cheese or yogurt. All that sterile food, plus the consumption of fatty, sugary junk food, is decimating the natural balance of healthy gut microbes, causing all kinds of havoc, including on our bodily systems for maintaining healthy weight. Researchers have recently discovered that junk food and processed food diets damage gut bacteria in a way that leads to unnatural weight gain. In other words, you'll gain more weight on a diet that harms gut bacteria than you will on a healthy diet, even if calories are the same. Food-borne, environmental and household chemicals, a lack of sleep, drugs, inadequate sunshine and Vitamin D and not enough exercise all prime your body for weight gain beyond what mere calories in, calories burned would predict. And, in fact, the vast majority of people in industrialized countries are damaging their bodies not with some but all these factors. The whole process of counting calories is an act of self-delusion. First, the difference between perfect weight and morbid obesity over a period of a few decades is less than 50 calories per day. Nobody can "count calories" with that level of precision. You can't know how many calories you really need. You can't know how many calories you're "burning." And you can't know how many calories are in the food you eat. Counting calories is a futile guessing game that doesn't get at the root of the problem. The problem is that people are trying to replace a functioning body weight balancing system with blind guesses about how many calories they're eating and burning. The solution is to fix your broken body, and allow it to naturally maintain a healthy weight for you. The way to fix your body is to fix your diet, get plenty of sleep, exercise outdoors every day and avoid all the toxic chemicals you can. And this is what the Spartan Diet shows you how to do. New research found that fermented foods like sauerkraut and kimchi help fight flu. A new study by Korea University, the World Institute of Kimchi, and Daesang Corporation found that laboratory rats injected with the flu virus and fed daily lactic acid bacteria had a 100% survival rate with no side effects. The research team has applied for two patents based on the research, and intend to develop and market "functional foods." We recommend plenty of fermented vegetable foods in your diet, foods like sauerkraut, kimchi and fermented hot sauce, which are Spartan Diet staples and which you can make at home.